Physiology seeks to understand biological function spanning the range from molecular mechanisms to medical problems. The discipline of physiology is uniquely positioned among the biomedical sciences to span the gulf between exploring the most fundamental aspects of biology and the most practical and applied problems of human and animal health. Our mission is to enhance understanding of the function of molecules, cells, tissues and organisms with an emphasis on their relation to human biology and medicine; and to contribute to the training of the next generation of research scientists, physicians and educators. Toward this end we have developed a graduate program in Molecular, Integrative and Systemic Physiology and post-graduate certificate programs in Anatomy and Histotechnology. Our department is devoted to outstanding research and is committed to excellence in education. The Department of Physiology is a vibrant, growing department that seeks to provide the most exciting environment for cutting edge science. Our roster lists over 15 primary faculty members and 10 joint faculty members who are involved in research and teaching, with interests that focus on endocrine-reproductive physiology, neuroscience, cancers of the reproductive tract, metabolism and aging. Members of the department have their principal appointments in the School of Medicine and are involved in interdisciplinary research with faculty in the Colleges of Agriculture, Engineering, Science, and Applied Sciences and Arts. Some faculty are also members of the Simmons Cancer Institute. Our vision for the Department is to strengthen our already outstanding basic science research programs by encouraging collaborations with clinicians and industry. No seminar on Friday, April 26, 2019 at noon in LSIII 1059. Dr. Zhengui (Patrick) Zheng was awarded a grant through the Eunice Kennedy Shriver National Institute of Child Health and Human Development to study the external genital development and mechanism of hypospadias. 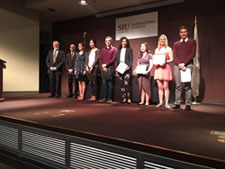 On April 14, 2018 the Department of Physiology participated in the annual SIUC Honors Day program. Click here for more information on the students honored. Jensen Cloe, a senior Physiology major, was presented this award for her work with Recreational Sports and Services. Click here for more information.